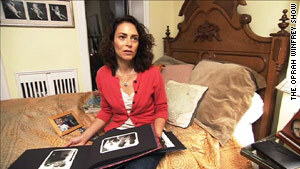 After his death, Julie Metz discovered her husband, Henry, had had multiple affairs. (OPRAH.com) -- They were a "Ken and Barbie" couple -- seemingly perfect to friends and family. When Barbra met her future husband, Michael Mastromarino, she says she fell deeply in love with him and thought of him as her soul mate. "It was almost like a dream," she says. "He was just this perfect guy." After they were married, Michael, a successful oral surgeon, and Barbra settled into a big home in the suburbs of Manhattan and had two children. Barbra seemed to have it all, but over time, her husband's perfect façade began to crack. "I found out he had a drug problem when his office called me and told me that he was passed out on the floor," she says. "He had a syringe in his arm." Michael's struggle with drug addiction eventually cost him his medical license, but as Barbra soon realized, he was hiding more than drugs from her. One summer night in 2000, Michael never came home. At around midnight, Barbra says she loaded her sons in the car and went looking for him. "I came upon flashing lights, and I saw Michael standing there with a policeman on each side of him," she says. "I started yelling, 'Michael, Michael!'" Suddenly, Barbra realized Michael wasn't in the car alone. He was with another woman. "When I first found out that he had cheated on me, I didn't want to believe it," she says. "I was shattered." Little did Barbra know, the worst was yet to come. After losing his medical license, Michael went into business selling body tissue for transplants and bone grafts. Barbra says she thought her husband's life was back on track when he made more than $4 million in four years. Then, in February 2006, Michael was arrested, and the grisly truth was exposed. Investigators revealed that Michael made his fortune by stealing skin, bones and other body parts from deceased men and women and selling them. Police say Michael dissected more than 1,000 dead bodies over the years. To make matters worse, Barbra learned that her husband and his associates knowingly sold tissue and bones infected with hepatitis, HIV and cancer to transplant patients, putting thousands of people at risk. "My life with him was an entire lie. Everything that I believed wasn't so," she says. "He always had a story. ... He lied to his attorney; he lied to me. He lied to everyone that crossed his path." Michael eventually pled guilty to body stealing, forgery, grand larceny and corruption. He's serving 25 to 75 years in prison for his crimes, but for people like Karen DelRe, time will never heal the pain these crimes caused. Oprah.com: Can you tell if someone is lying to you? Karen's 74-year-old father, James, was one of Michael's victims. "What was done to our father cannot be undone," she says. "This wasn't like a stranger broke in my home and stole a ring. They stole parts of my father, my family, my memories. All of it." When Julie Metz discovered her husband Henry's secret life, it was too late to confront him and get answers. Cardiac arrest had killed Henry a few months before. Julie says she ignored warning signs for 16 years and rarely questioned her husband, a man she describes as a loving father with a big personality. "It seemed like a good life," she says. "I was afraid. ... Finding too much or probing too much would have meant the end of what we had or what I thought I had." Then, one morning, Henry collapsed on the kitchen floor. Emergency personnel rushed him to the hospital, but it was too late. Doctors told Julie her husband was dead. "I felt like everything that I had, all the ways I had defined my life, were going to change," she says. "I felt very lonely almost immediately. He'd filled up the house with his big personality, and suddenly, the house felt very big and empty." Soon after, Julie was busy making funeral arrangements when she stumbled upon the secret life Henry had been hiding for years. She discovered e-mails from multiple women who'd had affairs with her husband. "When I found out about these women, I was completely enraged and I wanted answers," she says. "I got on the phone and called them up." Julie spoke to a woman her husband met at the gym, a mistress who lived in Argentina and two others. But, she says, the affair that hurt the most was with someone she'd known for years...the mother of her daughter's friend. Looking back, Julie says the shocking discovery she made that day helped her learn to depend on herself. "I found out that I was a lot tougher than I might have guessed. I could manage alone and take care of my daughter alone, and that was really comforting and reassuring," she says. "I also discovered that opening my heart again to somebody else would be okay and that I could trust somebody again." Now, Julie says she's in a relationship with a man who shares her core values. Karen Weinreb was once the epitome of a Wall Street wife. She received degrees from Yale and Oxford before marrying a successful hedge fund manager. When times were good, Karen says it wasn't unusual for her to spend $100,000 a month or more on credit cards. "I had no part in any of the finances ever in our marriage, so it was enough for me to be told by my husband that he was working on deals," Karen says. "I didn't ask any further questions." Fancy cars, trips to exotic locations, children in private schools and Madison Avenue shopping sprees quickly became the norm. "I became very seduced by the lifestyle," she says. Karen says she even overlooked signs that her husband was unfaithful and other marital issues because she didn't want to give up her Park Avenue lifestyle. Then, while Karen was pregnant with her third child, her husband came home from work one day and dropped a bombshell. He revealed that he'd swindled investors out of nearly $12 million over the past five years. After getting caught, he'd pled guilty to the charges without Karen knowing, and he was headed to prison. Soon after, Karen and her husband got into their gold BMW and made the 2 1/2-hour drive to prison. After her husband was taken away by guards, Karen says she sat in her car and sobbed. "Tears were pouring down my face, and eventually somebody tapped the window, and I looked over and it was the guard from the gate. He said to me, 'You all right, ma'am?' And I nodded yes. And he said, 'Good, because if you are, you need to move your car for another,'" she says. "It was my wake-up call that there wasn't going to be any sympathy for me. ... That day began for me an absolute nightmare. I came home, and I was suddenly a single mother of three very small children." Karen says her husband taught her an important lesson about relationships -- there's never just one secret. Now, she says she realizes she played a part in her husband's scheme. "I had some culpability in expecting this lifestyle -- in wanting this big lifestyle -- and expecting that the bills would be paid," she says. "In giving up my financial independence ... I did that without thinking about it."